Investors weren't smiling after hearing that sales growth turned negative in the fiscal third quarter. Colgate-Palmolive (NYSE:CL) trailed the market last month by shedding 11% compared with a 7% decline in the S&P 500, according to data provided by S&P Global Market Intelligence. The decline added to a tough year for shareholders of the consumer products giant, who are down 20% so far in 2018 versus the market's 3% uptick. 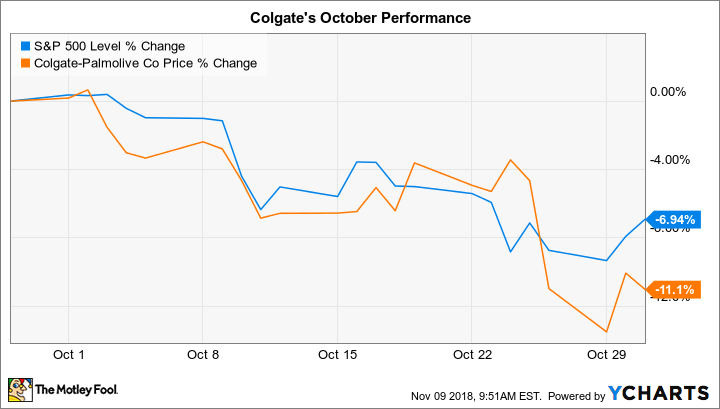 October's dip came as investors reacted negatively to Colgate's latest earnings report. They had some good reasons for that pessimism, considering sales turned lower after expanding slightly in the prior quarter. Price increases helped the toothpaste titan offset some of the sting from rising input costs. But profitability still declined. With 42% of the global toothpaste market, Colgate still commands impressive power in its core niche. However, as these recent results show, that premium positioning can't ensure rising revenue under challenging selling conditions like the ones affecting the branded consumer products space today. Colgate isn't powerless in this situation, though. In fact, management plans to boost advertising spending in the coming quarters to support demand. Executives are hoping the extra volume lift will be well worth the trade-off of slightly lower profitability over the short term.